Recently I made three quilts for the daughters of friends of ours. The youngest daughter, who is currently 7 years old told us that she loved pandas. Then, later, when questioned about her favorite color said it was pink. 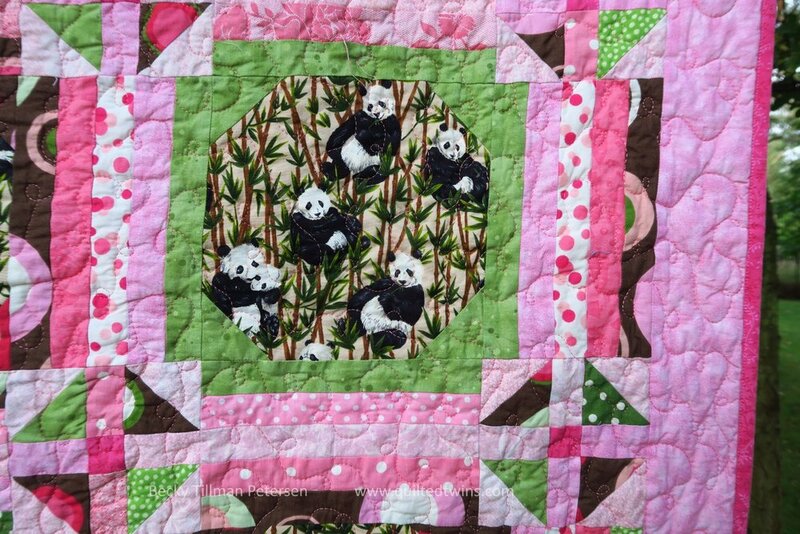 So my task for this project was to combine pink and pandas. This was not an easy task for me and I appreciated the help of my daughter-in-law, Claire, as she helped with the colors. I had only one fabric that was brown and pink. Pandas are black and white, but they sit in brown trees with green leaves. No, not necessarily. 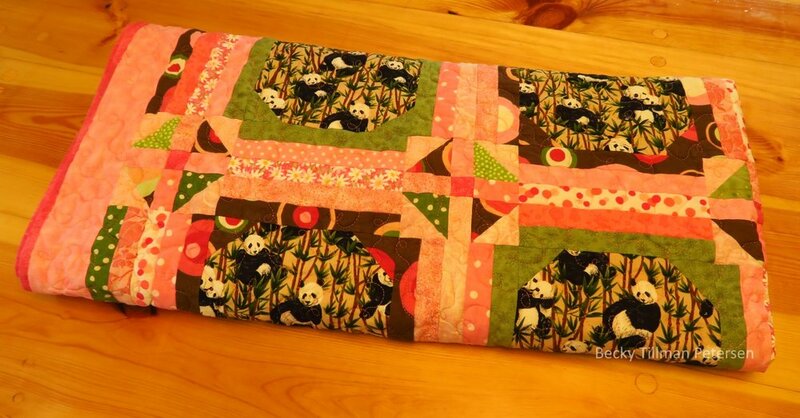 If I had been making this for an older child, I would have worked with a solid brown to frame those panda blocks and not that crazy wild fabric. But it's what I had. Ok. If I had had time to go to a store and find a nice small print with brown, pink and green, I would have. 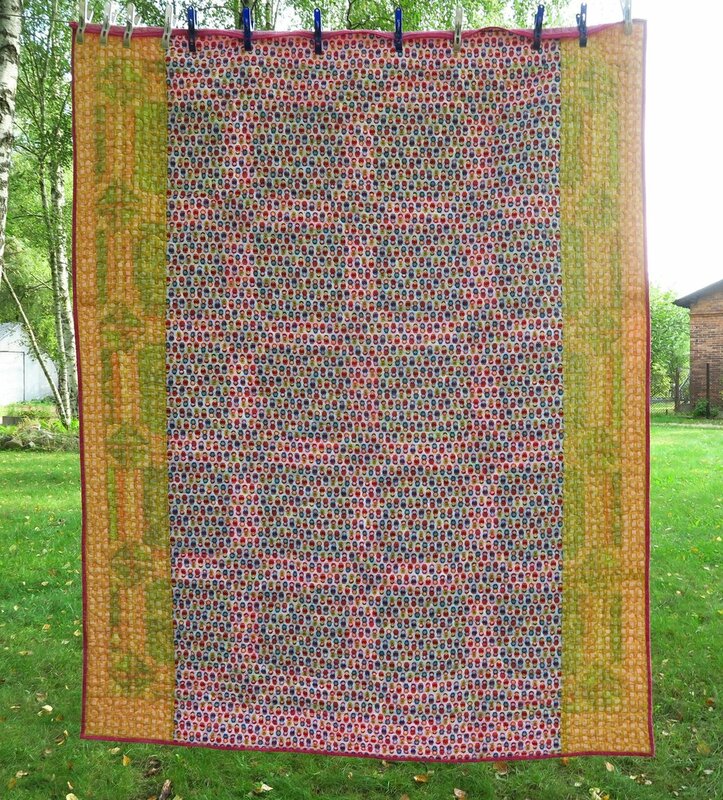 I was making all of these quilts out of only stash fabrics, remember! No running to the store! It's not as if my stash is small! I have way more cotton fabric than the local shop has anyway! Certainly I prefer the pandas surrounded with green. 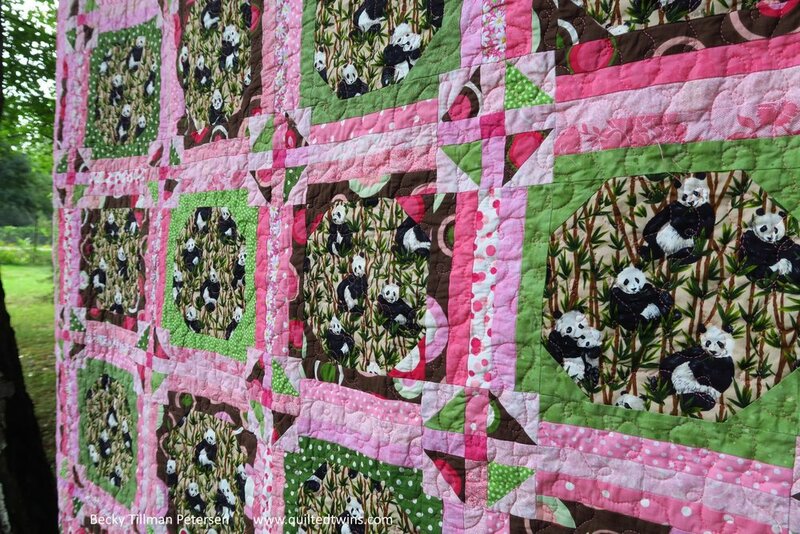 I knew that the brown/green/pink fabric wouldn't create the look of the frame I wanted, but I still wanted to use it to help tie in the pink to the panda fabric. Otherwise, pink was just thrown into the quilt with no reason whatsoever. I realize i was free to do that if I had wanted to - after all, it was my own creation - but still, I guess I just wanted to think it was all tied together somehow! The report back is that all three girls really like their quilts, so that is all that is really important anyway! 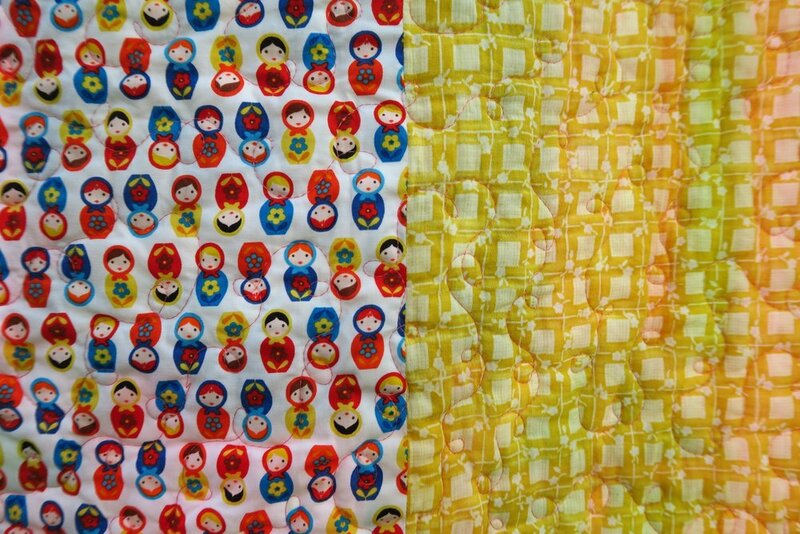 As with the first one - the one with the big cats, I wanted to use more of the Russian stacking dolls fabric in honor of their mother, we'll call her Leisa, who is from the Ukraine. She's actually been to our house, by the way, and was also one of my husband's early students when he taught there from time to time. I love the yellow with it. it's so bright and cheery! Having this backing on the quilt really makes it a two sided quilt. If they are feeling like they want to see their grandparents in the Ukraine and they are back in the states, or wherever, they can flip it over and use that side for a while. This fabric is a Robert Kaufman print and really nice. You should get some while you can ($4.99 yard!). All of these novelty prints that my sis has like this are a one time deal. If you don't get them now, then your chance at such a great deal may never happen again. While I realize that motivation may not be a very valid one after all, they are constantly creating new fabric lines, it may be the boost you need to get some while you can at this price point! I did get the pattern done and put it on the free patterns page. Just look down more than half way and you'll find it under The Main Thing's picture. Just click there. And that's what's been happening in my sewing room lately! At least one of them! Be sure to check out what my sis has for you over in the store! She's busy trying to keep you in fabric! Owls, Deer, Squirrels, Birds, Bears and more adorn postcards on the white fabric. Colors may vary slightly from what is shown. Part of our fall collection featuring fall colors and fabrics. Sunflowers, tomatoes, pine cones and other vegetables and fruits woven through a scene with ribbon. Large print. Fall fabric that features patches of sunflowers, scarecrows, pumpkins, Pilgrims, pinecones and other items that represent fall. We also carry a large scaled version of this print. Burgundy ribbon woven through fall flowers and vegetables including some tomatoes, apples, sunflowers, corn and other fall looking fruits and vegetables. Fall colored leaves with some gourds and some grapes thrown in for purple color. Beautifuil fall scenes inside large maple leaves on a background of beige and light brown twigs and acorns. Scenes include covered bridges, farm tractors and fall leaves on trees. Fabric features scenes of fall, including dogs with pumpkins, sunflowers, maple leaves and other great fall scenes. Really nice fall fabric featuring chickens, cows and corn in the harvested look, meaning that the husks are pulled away from the mature corn kernels. The fabric features gourds, pumpkins, grapes,, fall leaves and other fruits and vegetables traditionally thought of as harvested in the fall. Mushrooms are in there, too.